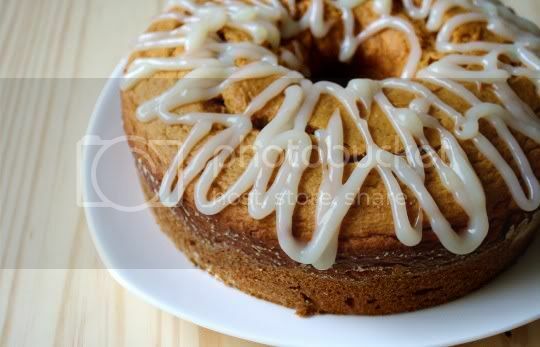 I had to wait an entire season to make this cake, thanks to the canned pumpkin conspiracy of 2009. But finally, I had a delicious, decadent fall dessert...which I actually ended up eating for breakfast. It's the versatility of such a recipe that makes this a year-round winner. The cake is relatively easy to make, with most of the time consumption resulting from baking and cooling. The first step of the recipe, draining the pumpkin, is actually a lot easier than I thought it would be. The canned pumpkin is spread between a mass of paper towels, in order to soak up the extra moisture and make the cake's texture lighter. After 10 minutes of draining, I was sure I'd have to scrape it off the towels, but it sort of just fell right off. Yay, easy. 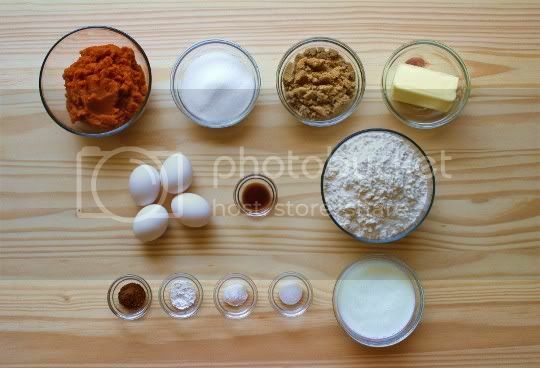 The rest of the process is pretty simple, with lots of butter-sugar creaming and ingredient-alternating batter additions. A note about the pumpkin pie spice called for in the recipe: unless you already have some, I'd suggest making your own instead of buying it. It's really just a blend of cinnamon, allspice (or ground cloves), nutmeg, and ginger (and I'd imagine most bakers already have those in their cupboards! ), and there's plenty of recipes online for it. Baking time is about 55 minutes, although I left mine in for an additional 10 or so before I felt it was ready. The cake has to be cooled completely before adding the glaze, so you've probably got abour 3-4 hours to go ahead and do something else. Now the glaze is...interesting. 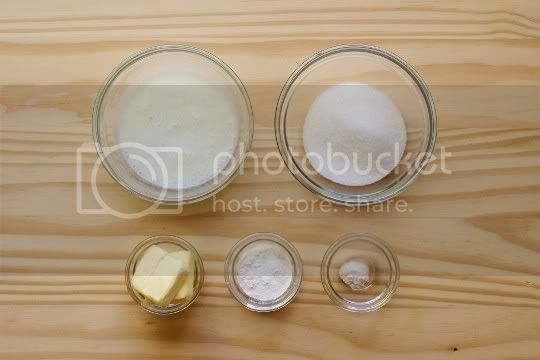 It's a simple combination of buttermilk, sugar, butter, cornstarch, and baking soda, which is cooked until thickened. I don't know if I cooked or boiled mine for too long or what, but the consistency was rather strange for a glaze, almost jelly-like. In fact, it was so thick that I was able to pipe-drizzle it using a plastic baggie. No glaze should be that thick! And the flavor is interesting too: it's buttery, rich, salty and sweet. 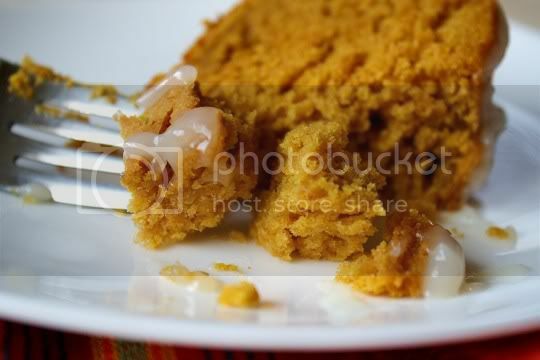 It's so buttery and salty, that I'd almost go so far as to say it tastes lightly cheesy, which makes for a strange combination with the pumpkin cake. The combination of pumpkin and cream cheese frosting isn't unusual, so I'm not quite sure why this just seems to miss the mark by a bit. I brought some of the cake to work, and coworkers either loved the glaze or hated it. You decide. The actual cake is quite delicious, and it probably would be pretty good without the aforementioned glaze. It isn't overly sweet (okay, so the glaze does help here), but it's super moist, dense, chewy, and velvety. 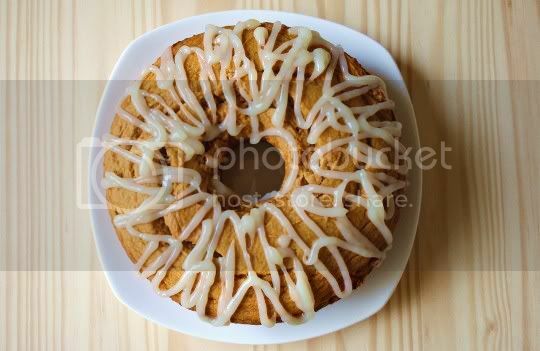 The pumpkin and spice flavors aren't overwhelming, but I'd definitely say the cake tastes even better the next day (although I'd suggest refrigerating it once the glaze is on). Make again? Perhaps. 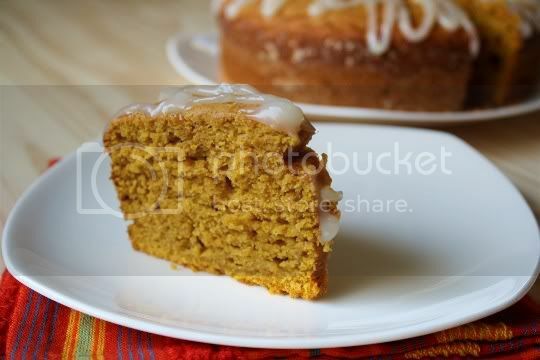 It's a good recipe for pumpkin loaf, but I'd try a different glaze/frosting or none at all. Vegan variation: Use vegan butter, egg replacer, and buttermilk substitute.